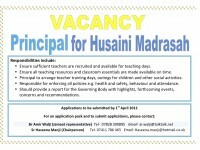 The Husaini Madrasah is looking to appoint a new principal to take over from the current principal from September 2012. Please click here for the principal vacancy poster and contact one of the two individuals as cited on the poster if you are interested. 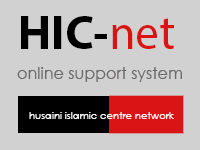 The Madrasah is also looking to recruit three more governors. Please click here for the governor vacancy poster and if you are interested in becoming a governor, contact one of the two individuals as cited on the poster.